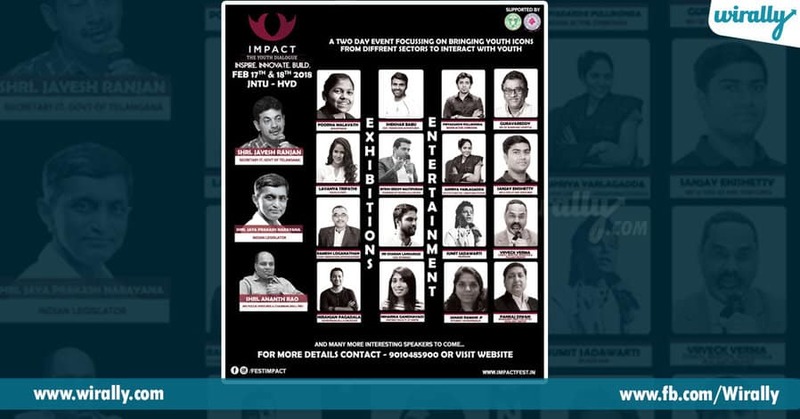 IMPACT 2k18 is organising a mind-blowling fest which will incoparte youth icons from different sectors to interact with youth. 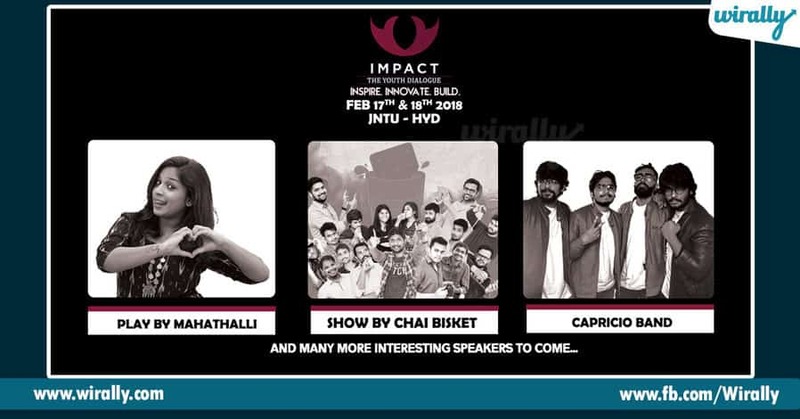 IMPACT is a two-day fest scheduled this weekend and everybody attending the event is going to experience Telangana’s biggest youth festival in JNTU-Hyderabad Auditorium on the 17th and 18th of February. 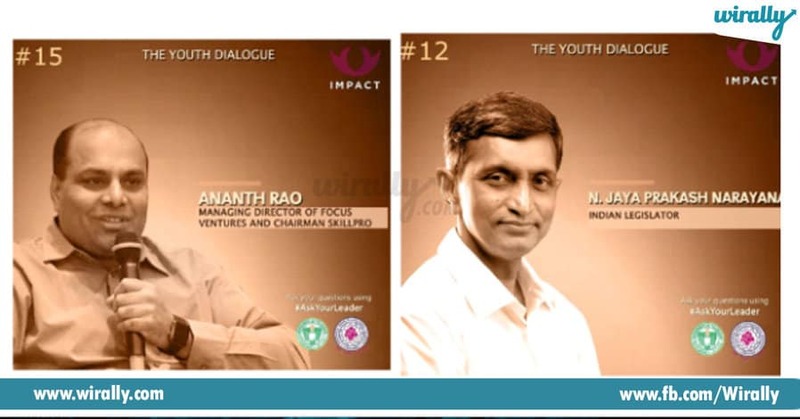 IMPACT is an event that aims to inspire young minds by interactive sessions with pioneers and successful people from various sectors of life. It is a great platform for the students to exhibit their creations and see them come to life. It has many different elements that every student has something to take back home. On the first day Darshini Shekhar will be inaugurating the event and share her insights to success. Shri Jayesh Ranjan, Principle Secretary IT, Govt of Telangana, Supriya Yarlagadda, Executive Director-Annapurna Studios, Ananth Rao, MD Focus Ventures and Chairman Skillpro are few among the leaders who will be there to motivate you. You will also witness Niharikha Gandhvadi, Niranjan Pagadala and Janaki Ramani Pendyala discussing jobs due to digital transformation. Then there will be an interactive session with the actress Lavanya Tripathi, who will motivate the students with her story to success. There will also be demonstrations of 5 best projects by the founders. 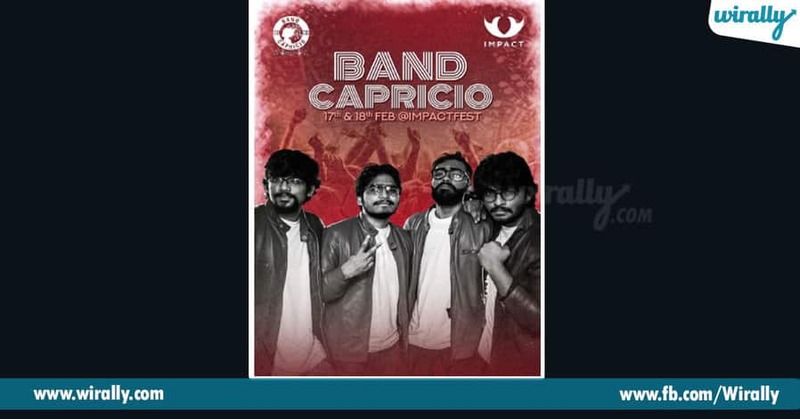 The fun part will be continued by the most energetic YouTubers Capricio Band and Jahnavi Dashetty with their much entertaining session. For the second half of the event, we will have Shri Jaya Prakash Narayana, a leader with youth engaging capacity to address on the lines of the role that the youth plays in politics. Followed by him will be AV Guruva Reddy, Ritesh Reddy and Ramesh Loganathan addressing the students for a better future. After that, there will be a demonstration of 5 best products by the founders followed by a panel discussion with Viiveckk Verma and Pankaj Diwan on the culture of innovation in college. After the insights from industry leaders, we will have the man who swept us off our feet with his dialogue delivery, non-other than Priyadashi, who will inspire young fellows with his story to the limelight. Finally to top the cake we have the very famous Jahnavi Dashetty known as Mahatally’s play. 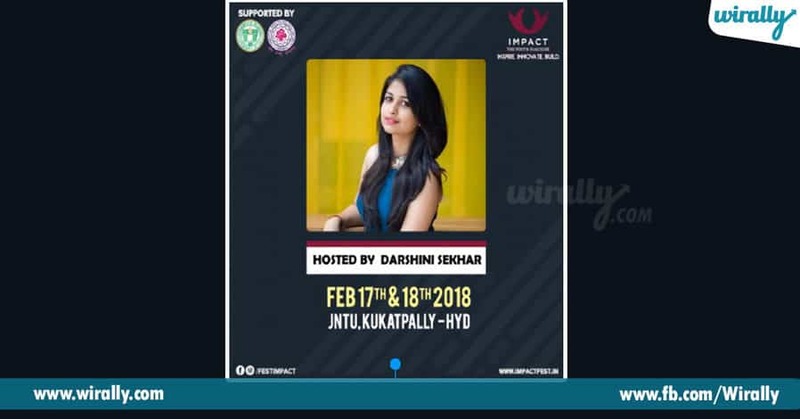 After long gap of 6 months our well known Darshini Sekhar who is known as Geetha from Geetha Subramanyam is goin to host the event. This is not all of it, we have Sanjay Enishetty and Sri Charan lakkaraju to grace the event as speakers to talk about the harsh realities of the start up world. There are many other interesting speakers who will also be present there. There are plenty of events and stalls planned to keep every student busy and also not to forget the Chai Bisket Team and Girl Formula with their much entertaining session. Last year’s IMPACT has done it’s part in creating a beautiful impact in changing students lives. Sreerama chandra, Senthil kumar, Anil Bokil were some of the speakers for Impact 2k17 who did their magic in making it a big success. Heres a sneak peek into last year’s IMPACT. 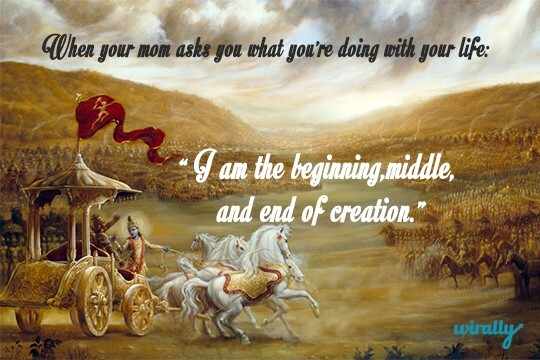 Be there before it is too late and experience the magic of knowledge and innovations. You can go ahead and get your pass with the link mentioned below. To know more head to the website.